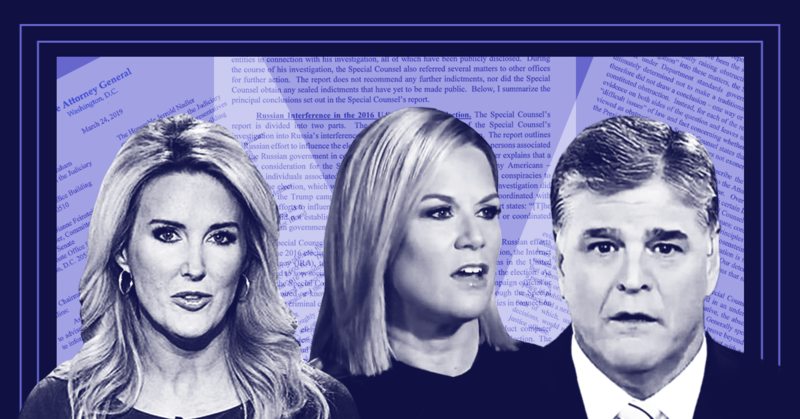 The day after Attorney General William Barr released his summary letter on the findings of special counsel Robert Mueller's investigation into Russian interference in the 2016 presidential election, nearly half of Fox News’ segments on the Mueller probe mentioned the idea of future investigations into those involved in the probe -- as well as Trump’s perceived enemies. 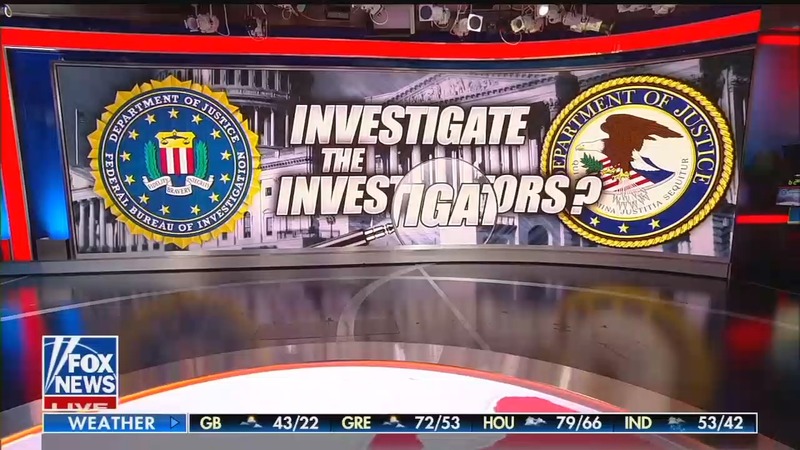 As the Mueller inquiry concluded, Fox News figures and others on the right began to ramp up calls for new or reopened investigations into Hillary Clinton, the FBI, and the Russia probe itself. President Donald Trump and Sen. Lindsey Graham (R-SC), both pushed the idea of investigating the investigators on March 25, with Trump saying that some people involved in the probe “will certainly be looked at” and Graham promising to “try to find out” whether investigators’ actions were nefarious. Fox News aired 118 segments about the Mueller probe that day, and 58 of them -- 49 percent -- mentioned the possibility of future investigations against those involved in the probe or perceived to be against Trump; 26 of those segments featured someone specifically endorsing additional investigations. Anchors, hosts, and guests repeatedly discussed the possibility of investigating a whole slew of people who worked in the Obama administration. The list of people and organizations who Fox figures and guests felt should be targeted for investigation included Hillary Clinton, Barack Obama, the FBI, the Department of Justice, former FBI Director James Comey, former acting Attorney General Sally Yates, DOJ official Bruce Ohr, former FBI agent Peter Strzok, former Attorney General Loretta Lynch, former CIA Director John Brennan, former British intelligence agent Christopher Steele, Fusion GPS, the Clinton Foundation, former national security adviser Susan Rice, former Ambassador to the U.N. Samantha Power, former Director of National Intelligence James Clapper, and more. Statements noting Republicans’ desires to investigate the origins of the Mueller probe were common refrains on Fox News, with Fox & Friends’ Steve Doocy asking viewers, “Is it time to investigate the investigators?” On Fox & Friends First, co-host Heather Childers asked, “Should the Obama administration, should Hillary Clinton now both be investigated?” Her guest, attorney Jenna Ellis, responded, “Absolutely.” On Fox & Friends, Fox contributor Mike Huckabee claimed there was an “attempted coup d’etat” while demanding that Republicans “counterpunch hard” by investigating the Justice Department and FBI. When Graham held a press conference to talk about future investigations, Fox News aired 20 minutes of it. Fox News anchor Martha MacCallum drilled her guest, Rep. Steve Cohen (D-TN), on whether he’d support investigating “the origins of this investigation. What President Obama knew, what Loretta Lynch knew, what James Comey knew, what John Brennan knew.” Sean Hannity’s entire show basically revolved around discussing future investigations and the idea of a “day of reckoning” for Clinton and everyone else in the Obama administration. We defined as segments discussions in which special counsel Robert Mueller’s report on Russian interference with the 2016 U.S. presidential election and related matters was the stated topic of discussion or in which at least two speakers in a multi-topic discussion discussed Mueller’s report with one another. We then coded each segment for whether 1) anyone mentioned the possibility that Mueller, others involved in Mueller’s investigation, or those perceived to be against Trump could also be investigated; or 2) anyone explicitly endorsed investigations of Mueller, others involved in Mueller’s investigation, or those perceived to be against Trump.